Hmm, well last weeks rumour that Belle would be here in a week or so still hasn’t appeared (or have I missed something?). It’s still November…there’s still time. 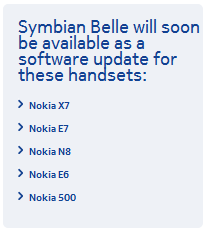 And Q4 doesn’t officially end until December 31:p.
It seems though that the Belle coming soon page has been updated with N8 and E7 along with X7, E6 and 500. I can’t wait for this to get on my N8! (I mean the official one, not the various leaks some of you guys have been brave enough to try). Cheers Zeih for the tip.